as a totally godless person, i find my fascination with gospel music a little peculiar. for months now i've been fixated all manners of old time gospel recordings, digging deep on these archival comps of forgotten sounds. in the same way that you can look at a beautiful gothic church and marvel at the achievement made by its designer, these recordings triumph in the craft of song writing. even though both are made with religion as the driving force behind them, most anyone religious or not can take in the beauty of the end result. and just as any kind of music is informed by the artist's passions in life, the result of these songwriter's faith combined with the barest essentials of american music's tools present such astonishingly honest music, completely stripped and with nowhere to hide, that i can't help but listen and be moved by their sincerity. standing apart from most of everything i've heard in the genre, though, is washington phillips. performing solo, self-accompanied on a bizarre, little known zither-like tiny piano instrument called a dolceola, phillips' sound is so lush and distinct that it immediately caught my interest. the gorgeous sound of the dolceola combined with phillips' earnest sermons is completely sublime sound. 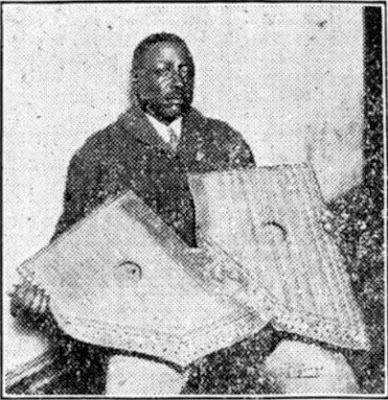 recorded between 1927 and 1929, "I AM BORN TO PREACH THE GOSPEL" collects all of phillips' recorded output. it may sound too stark or subdued upon first listen, but give it a few listens and i'm sure it will grow on you.